Throughout 2005 writers sent in their writing goals and received monthly reminders to meet those goals. After reading these goals and those writers submitted in 2005, consider submitting your own via the form at www.writershelper.com/writing-goals.html. Get the alphabet book published. 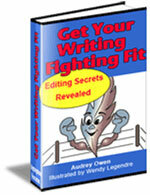 Publish a blog on writing and publishing. I want finish and publish my FFTS ebook on my website. To begin a new book to follow Face Your Fears, subject of childrens book: God has a special purpose just for you. a. To consider other books making it a series. One new article per week about learning japanese from anime. Finish translating The Memorygrabber into Portuguese. Finish writing the e-book Learn Portuguese Now. Develop an e-course about the Portuguese language. Add 2 pages a week to my Web site. Improve my writing skills in English through reading and practicing. I wish to have at least two books published this year. I want to establish myself as a freelance writer. To complete one chapter per month of my novel revision and to continue writing at least one non-fiction article or power point presentation for non-profit organization. read magazines and write reviews on magazines. read at least 3 books per month. Adding one page to my website every week. Starting in September I will add several book reviews a week to my book website.